Tara, ancient seat of the High Kings of Ireland. 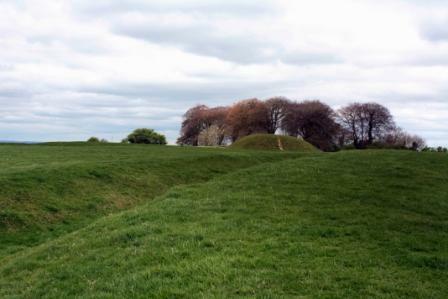 Mound of the Hostages at Tara in County Meath. You can view a far more informed and detailed description of Tara and its significance by award winning documentary maker Mairéid O'Sullivan below. 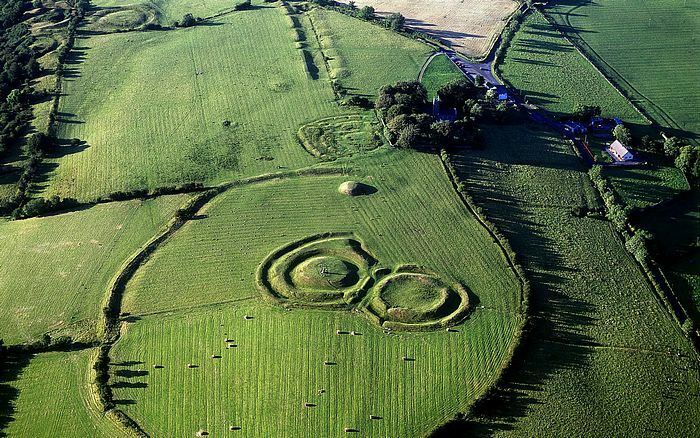 1 Newgrange, or Brú na Bóinne as it is known in Irish, is not far from here and Ireland's most historic monument. It predates the Pyramids of Egypt and is still precisely aligned to the Winter Soltice on the 21st of December some 5000 years later. 2 Navan is a lovely old market town and birth place of Francis Beaufort who invented the Beaufort windscale. 3 Take the back road to Slane signposted Duleek and explore the river Boyne by walking along one of the many lovely tow paths. 5 Take a left turn to visit Slane village, check out the four large houses opposite each other at the crossroads which originally belonged to four sisters. 6 Or climb the Hill of Slane go straight through the crossroads, take a left and walk up to the churchyard there. This where St Patrick infamously lit the first pascal fire in defiance of the High Kings of Tara. 7 Visit the Battle of the Boyne centre, Oldbridge, County Louth which commemorates the biggest battle in history of Ireland which took place in 1690. 8 Mellifont Abbey 12th century Cistercian abbey with octagonal lavabo, retrace the footsteps of 800 years, as you cross that well worn threshold. 9 Monasterboice see the 17ft tall high cross of Muirdeach with its intricate carvings. Click on the following link to return to the homepage re St Patrick's Day.